Zimbabwe was robbed. At least, that’s the official interpretation. But such was not to be. The Zimbabwe government invited in Chinese companies, who—with the help of corrupt officials—took most of the diamonds. President Mugabe acknowledged as much, saying publicly that about US $15 billion of diamonds was taken illegally. People throughout Zimbabwe demanded justice. They were not happy. Among the least happy was comedian and actor Silvanos Mudzvova; he staged a one-man demonstration at Parliament to demand his share of the diamond money. Despite the fact that the government had agreed that the diamonds were stolen, officials arrested Madzova and detained him. Upon release, however, Mudzvova continued his campaign. He toured the nation, performing a one-man play entitled “Missing 15 Billion Dollars. I Need My Share.” To the displeasure of the government, huge crowds attended. This isn’t the first time that Mudzvova has used theatrics to protest human rights violations. 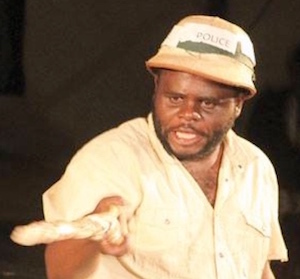 He has produced and starred in other plays, some of which denounced the forced displacements of the urban poor back in 2005. Each time he has come forth publicly, the government response has been to attempt to push him back. But those attempts have not been successful.